The price, the vintage look, finish, and quality tone of this guitar will be a big winner for everybody. Great note definition. Keeps its tuning. Nothing that's a deal breaker. The Reissued Series from Brit brand Vintage is about revisiting classic electric guitar styles to inspire new instruments. Those who started playing in 1972 might experience a warm fuzzy feeling at the VHB72's silhouette. Sure, the headstock's different - it's more of an S-style silhouette - but the guitar's profile and semi-hollow chambered body reveal the Thinline '72 Tele as the chief inspiration. There are some tonal similarities, too - both sport humbuckers to tame feedback and kill noise in high-volume settings, and both could be put to work on the same songbook. Nonetheless, the V72 has plenty to set it apart. "The V72 walks a line between the past and the present." The V72 has a one-piece maple neck, with the subtle swell of a volute under the nut, bolted on to the body. The Wilkinson WVFS bridge is a neat, string-through arrangement with a six-saddle block tailpiece, more 2016 than '72, and super-stable. A set of Wilkinson Deluxe tuners - their design in the classic Kluson style - helps maintain the vintage vibe and keep things in order. This is a guitar with backbone, and it's hard to throw out of tune. Vintage claims that the 'buckers have great low-end response - good and tight - and that's true. 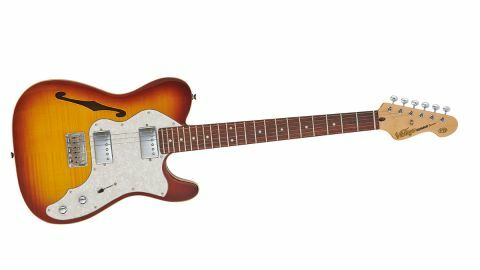 We find that, for a semi-hollow, chambered electric with high-output pickups, the V72 is never shrill. It has the Tele-esque twang and great note definition, no matter what pickup you're switched to - bridge, neck, or both. Its bright and characterful mids are harmonically rich. Country and blues tones sit square in the V72's wheelhouse, but it has plenty of attitude for hard rock, too, with a little feedback always in reach when you crank the gain up high. Spend some time with the V72 and a pattern emerges. It looks old-school, with the glitzy chintz of a pearloid pickguard, while the flame-maple veneer adds an uptown aesthetic that belies the price tag. And yet there are concessions to modernity, such as the military-grade minimalism of the tailpiece and the relatively unobtrusive heel. The V72 walks a line between the past and the present. It feels like it's rooted in both worlds where, say, an Epiphone Blueshawk is more of a throwback, while Squier's Vintage Modified '72 Tele Thinline is more period-appropriate. It would be nice to try a V72 fitted with a clubbier, more rounded neck profile, which could only add to its sturdiness, but the easy ride on offer is going to be a big winner for beginners looking to navigate the fretboard more nimbly.